I am going to Live-Aboard, dive, eat & repeat - are all y'all? If you are a sincere scuba diver just signup, and call to pay in advance (and it is non-refundable). No on-the spot registration and seat is limited! 2 nights and 2 days of diving for a total of up to 7 dives with 27 fellow scuba divers @ Texas Flower Garden Banks - Diving the Texas Flower Gardens- visibility Protected content , diving depths Protected content . The reef habitat is about 36 acres and has a series of sponge- and fire-coral-cloaked pinnacles jutting 10 feet high along the northern side of its crest. Known as a northern Gulf hotspot for fish-watching and photography, Stetson is home to several remarkable fishes such as sailfin blennies, golden (morphed) smooth trunkfish and even longlure frogfish. The East and West Flower Garden Banks, 13 miles apart, are the northernmost coral reefs on America’s continental shelf. At 28 degrees above the equator, it’s a miracle of nature that allows just the right combination of Gulf Stream eddies with steady food supplies, a hard surface, temperature, and light to charge these small and isolated mounds. They rise to a depth of 65 feet from the surface and produce thriving coral communities — the nearest live-coral reef is Protected content away. They remain somewhat off the radar for many divers, yet “healthy,” “sustainable” and “near pristine” are descriptors used by divers who know these two exceptional coral reefs. The crests at both banks are composed of a dense array of hard corals, mostly brain and star corals, many of them massive, boulder-shaped formations that create a majestic living seascape of wonderful forms and hues. Stetson Bank is the third reef of the Flower Garden Banks National Marine Sanctuary trio of jewels located in the northwestern Gulf of Mexico, 75 to Protected content off the Texas coast. All of the sanctuary reefs sit atop salt domes formed Protected content years ago; unlike its two cousins 35 miles away, Stetson Bank has a base of siltstone and claystone rather than a limestone substrate produced by corals. Saturday Protected content and Sunday Protected content ! Please feel free to reach out to me in case of any other information. Sorry, no payments on the spot so please book your seat immediately. 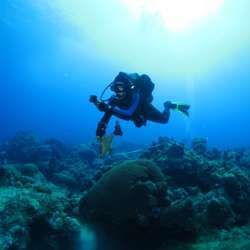 Hope to see all y'all at Texas Flower Garden Banks - Let's enjoy diver's weekend getaway!